Home ⁄ Blog ⁄ Backorder an Expired Domain for your Startup! Snap the domain of your dreams by making a so called backorder (a.k.a snapback) of a domain name that is expired and about to be inactivated. The backorder tool is available in our free domain manager. With our domain backorder tool you can list all expiring .com and .net domains, filtered by your search term and desired length. Once you have set the desired filters, the backorder tool lists all matching domains that are about to expire. If you find something exciting, you can easily place a snapback order. To place a snapback order, you need to deposit 15 USD in your Control Panel Wallet (payment via credit card or PayPal). Once you have placed your order, we will attempt to register the domain for you the second it becomes available. If the snapback is successful, we will charge 15 USD from your deposit. In case someone else would win the race to register the domain, you will be notified and your funds will remain in the wallet. You can then use your funds for registering another domain or for payment of any other of our hosting services. Please note that you can not make a backorder from the DEMO account. 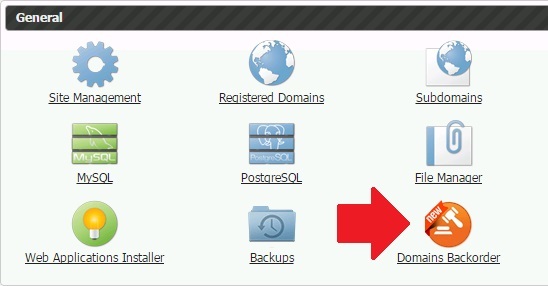 You need to have a Domain Manager account or a web hosting account. You get our Domain Manager for free when you register a domain with us. Click Search, and matching expiring domains will be listed. Once you have found a domain that you would like to snap, click Backorder on the far right. If there is no credit in your Wallet you will be shown a link: Refill wallet. The lowest amount you can deposit is $20 USD. If we do not succeed in registering the domain for you, you can use the funds for another backorder, a regular domain registration or for any other of our services. Good luck hunting for the perfect domain!